The Chandelier 2097/30 1958 was designed by Gino Sarfatti for Flos and is a modern interpretation of the contemporary chandelier. A steel tube in the middle conceals the power cables that come out of the lightbulbs, ensuring a stylish yet simple design. Thirty lightbulbs are harmoniously distributed on the arms of the chandelier made of brass and immerse any room in soft light. Unlike many other classic chandeliers, the 2097/30 looks modern and classic at the same time. The Flos chandeliers emit diffuse light that evenly illuminates the environment and creates a warm atmosphere. The E14 version includes 30 classic bulbs with max. 15 watts, that aren't included in the delivery! The pendant lamp is fixed in the middle of a steel ceiling fitting and rose. With a height of 72 cm, the chandelier is best suited for high ceilings and has an unmistakable charm especially in old buildings and lofts. Isolated product image of the chandelier 2097/30 by Flos in chrome. The lamp by Gino Sarfatti is a modern interpretation of the contemporary chandelier. Lifestyle product image of the Flos - chandelier 2097 in chrome. 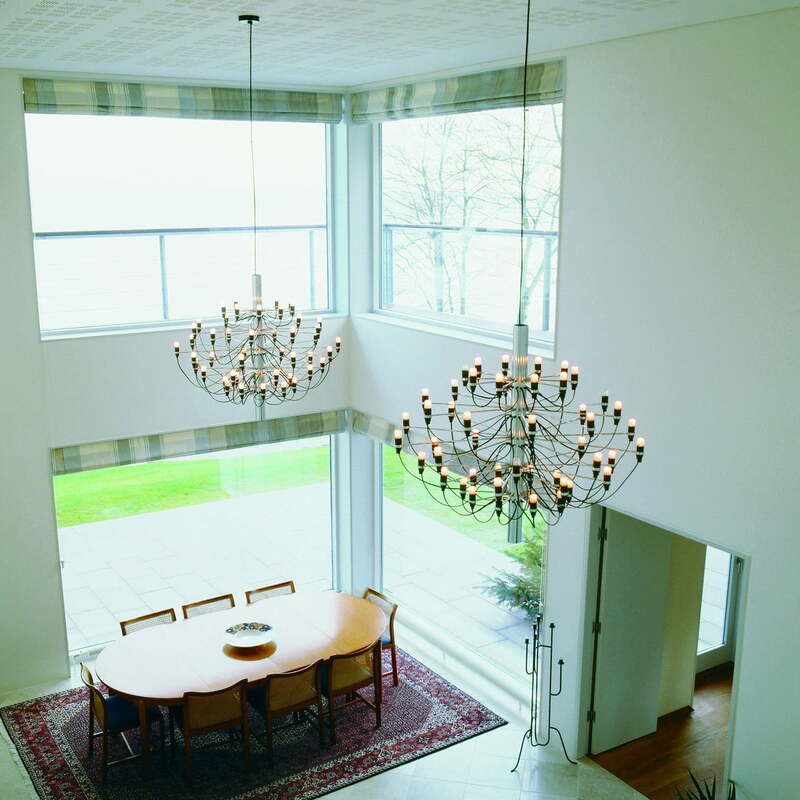 The modern chandeliers by Flos is particularly well-suited in rooms with high ceilings.